EL SEGUNDO, Calif.--(BUSINESS WIRE)--Chicken of the Sea International has finalized a multifaceted alliance with the Cabrillo Marine Aquarium (CMA) in San Pedro that includes sponsorship of a year-long series of lectures, workshops, events and activities designed to educate South Bay teachers, students and the public about the importance of marine stewardship and ocean-based sustainability. The announcement was made today by Roxanne Nanninga, North America Sustainability Director for Chicken of the Sea, in conjunction with the May 2 observance of World Tuna Day, established by the United Nations to raise awareness of the global importance of tuna and promote responsible fishing practices. 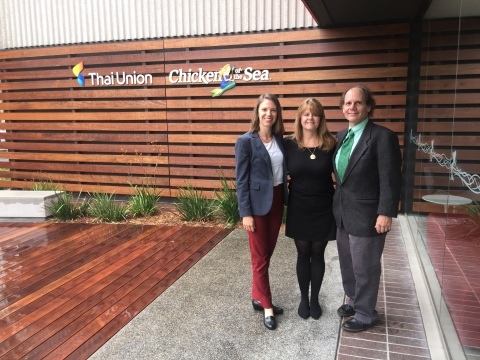 Chicken of the Sea will become a Cabrillo Marine Aquarium Corporate Circle Bronze partner and sponsor both existing and new CMA programs under the umbrella of Sea Change, a comprehensive sustainability strategy by Chicken of the Sea parent company Thai Union Group to drive meaningful improvements across the entire global seafood industry. Earlier this month, Chicken of the Sea relocated its corporate headquarters and staff of 150 from San Diego to El Segundo, Calif. The move established a North American headquarters for Thai Union Group, the world’s largest producer of shelf-stable tuna products with annual sales exceeding $3.7 billion. Chicken of the Sea will also work with the CMA to create sustainability-focused lesson plans prior to co-hosting a teachers’ workshop at the Aquarium in Fall 2019. To provide tangible examples of sustainability and traceability, the brand will include Chicken of the Sea products certified by the Marine Stewardship Council (MSC), the industry’s most exclusive designation for fisheries stewardship, in the Ocean Discovery Kits given to participating educators from the El Segundo, Los Angeles and other school districts. Other elements of the partnership include Chicken of the Sea sustainable seafood recipe tastings and presentations at Friends of the Cabrillo Marine Aquarium Grand Grunion Gala on May 5 and Sustainable Seafood Expo on Oct. 6-7. Chicken of the Sea will also use the alliance with Cabrillo Marine Aquarium to launch future participatory partnerships with local schools, which will be announced at a future date. For more information about Chicken of the Sea, go to www.chickenofthesea.com. With its spectacular natural setting adjacent to Cabrillo Beach Coastal Park and the Port of Los Angeles, Cabrillo Marine Aquarium is uniquely suited to its leadership role in marine science education, aquaculture research and community recreation. The historic Frank Gehry-designed aquarium displays the largest collection of Southern California marine life in the world. Since 1935, CMA has provided visitors with both a natural and interactive approach to learning about the marine environment of Southern California. Friends of Cabrillo Marine Aquarium is a nonprofit organization that exists solely to support the Aquarium, through grants, an active membership program and corporate sponsorships. For information about Cabrillo Marine Aquarium events, exhibits, conservation and educational programs, admission prices and operating hours, go to http://www.cabrillomarineaquarium.org/. Headquartered in El Segundo, Calif., COS uses responsible fishing practices to source its seafood products from around the world, and packages them at a state-of-the-art processing facility in Lyons, Georgia, as well as at third-party facilities. The company is led by a team of industry veterans with more than 300 years of collective experience in the packaged seafood industry. Chicken of the Sea has formed a multifaceted alliance with the Cabrillo Marine Aquarium of San Pedro timed to the May 2 observance of World Tuna Day.